I am writing this in regard to the headlines I have seen on Fox and Forbes this past week that went something along the lines of "An Inconvenient Truth for Al Gore". The spin here is ridiculous. Below are some key points. Scientists weren't trying to debunk all of what Gore stated in his movie "An Inconvenient Truth" they were saying that he threw in some exaggeration. The medieval warming period in the 1600's which was as warm as it is now was due to natural fluctuations. Scientists agree on the fact that the current warming trend is due to us. It is scary to consider that us human beings have the power to bring about something as major as a global warming trend. Scientists do not know how long it will last or if it will "naturally" reverse. We are talking about something totally different than a natural flux, we are talking about a man made issue. The article I read on Forbes didn't mention a single thing about the CO2 levels in the atmosphere which was one of the biggest arguments Gore made in his movie. OK so I know this isn't the best put together piece. I don't have time to make this pretty. I just wanted to get my opinion out there. The media needs to pay attention to what it says and the effects that it causes. When I read the headline I just thought to myself "Wow, there must be conclusive scientific evidence negating what Gore said. Whew, what a relief!". In reality when I read the paper on Forbes it said, to paraphrase, that scientists are in agreement that this current global warming trend is due to us. I wonder how many people skimmed that headline or even the first few paragraphs of the article and thought what I thought without bothering to read further. Wahoo its almost time for finals!! OK so I don't really get that excited over finals. It is definitely a time to pause and reflect on how far I have come in my schooling and how far I still have to go. It is hard to believe I have already been in college for nearly 3 years. I have the majority of a General Science major completed and I have a Chemistry minor under my belt. Also as of this year I have taken on another major, Computer Science. I am getting used to college which is a very good thing considering I have slightly under a decade left to go. Yes, I am shooting for a PhD, probably in Bio-informatics. You must be thinking, wow this guy loves school. Well, yes and no. I really like learning about things I am interested in. I love the college atmosphere. I absolutely hate doing assignments and required classes that I do not want to do. The only thing that keeps me going through those classes is the fact that they are needed to take the ones that I really want to take. I really like Bio-informatics. I took up computer science after completing a biology course because I was introduced to Bio-informatics. However I went into the CIS (computer and information science) field knowing that it would be a good 2 years of prerequisite courses before I was eligible to get into my first class in Bio-informatics. I am almost one year into that goal now and the harder year lies ahead. I am not shooting blindly though. I study bio-informatics on my own and I volunteer in bio-informatics labs at the university when I can. It is really a fascinating field. I guess I will quickly write about what exactly it was that got me hooked on bio-informatics in the first place. I was in my 3rd term of the "Foundations of Biology" sequence which is one of the two possible lower division required sequences for Bio and pre-med students at the University of Oregon where I go to school. Going into that class I was a pre-med student as so many of us science related students are at the U of O. We had an open project to study the genetic sequence of HIV from a large population of HIV positive patients with varying rates of CD4 decline. We got the information from a paper written by Markham et all circa the early 90's. Pictured to the right is the image of the protein on the HIV molecule that we had genetic sequences for with a color coded conservation score from the study's participants who had a fast rate of CD4 cell decline. Circled is the molecule that I theorized was partially responsible for the fast rate of decline because it is highly conserved in the patients with quick rates of decline and it is very lightly conserved, if at all, in patients with a slower rate of CD4 decline. It was such an exciting thing to find that I instantly fell in love with the field of bio-informatics which studies problems exactly like this one. I could keep blogging on but I need to get ready for class now. More from me later on this and other topics. Last night I closed my finger in the car door. 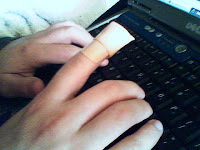 It hurts quite a bit and typing is pretty dificult. I will post something more substantial when I can type again.